If you continuously find yourself venturing out to loud concerts or social events, picking up a pair of custom moulded earplugs could be a great investment for your ears. While most people think of disposable earplugs when it comes to preventing noise-induced hearing loss, custom earplugs are actually much more effective. At Audiology Innovations in Calgary, we love educating our custom earplug customers on the benefits of personalized earplugs. In this article, we’ll introduce a few of the benefits of custom earplugs, so you have a well-rounded understanding of why they’re so great! What Exactly Is A Custom-Moulded Earplug? A custom-moulded earplug is typically produced in a high-quality laboratory setting, made from actual moulds of your ear. When you visit a professional audiologist like the experts at Audiology Innovations, our trained specialists will mould an impression of your ear and ear canal using an acrylic or soft silicone material. Once the earplugs have been carefully manufactured, they will fit comfortably and snug in your ears for optimal sound protection. These earplugs are often delivered in a protective storage case with a small tube of lubricant to assist you during their break-in period. The lubricant will make it easier for you to insert the earplugs into your ears, especially during the first few wears. 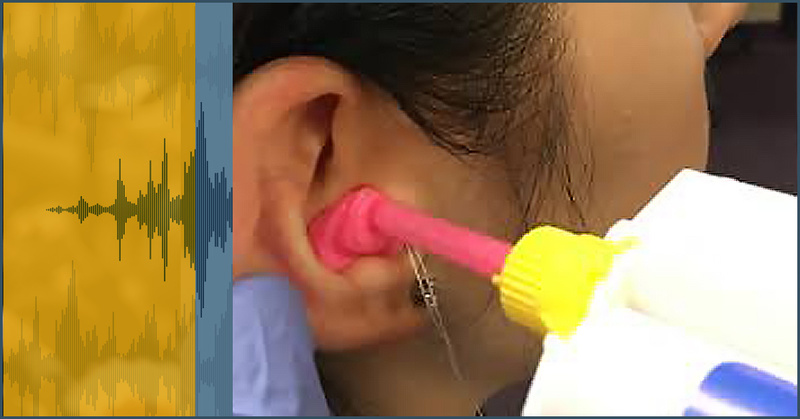 After a handful of applications, your custom moulded earplugs should be easy to to use, without the help of additional lubricant. Since a majority of custom earplugs are moulded from a silicon material, they last significantly longer than disposable earplugs. Depending on the care of the earplug handler, custom moulded earplugs can last between three to five years, and even longer. A common problem with disposable earplugs is that they tend to be too big or too small, depending on the size of your ear and ear canal. When you have a custom moulded pair of earplugs created specifically for your ears, your audiologist can adjust them to fit any size and shape. Even if your ears have an unusual form due to a birth defect, disease, or a past surgery, custom moulded earplugs can easily be fitted to accommodate any type of ear. When you visit your audiologist for custom moulded earplugs, you can have them specially created with filters to determine the amount of noise reduction you want. Most earplugs are able to provide about 25 to 30 decibels of noise reduction, however you have the option of adding filters to provide even more protection. At Audiology Innovations, we offer custom earplugs for everyone from musicians to swimmers and more. If you’d like to make an appointment with one of our certified audiologists in Calgary, contact us today! There is a common misconception that disposable earplugs will work for everyone, however it’s important to understand that no two ears are the same. If you’re unsatisfied with the comfort level of normal, disposable earplugs, custom moulded earplugs provide long-lasting, ample comfort. Since personalized earplugs are created from the actual impression of your ear canal, they’ll fit perfectly inside of your ears. When you have a pair of custom moulded earplugs made, you’ll never have to worry about spending the money on disposable earplugs again. Most employees who are exposed to loud noises can use up to four pairs of disposable earplugs a day. When you consider a company with 200 employees, they’ll go through 500,000 disposable earplugs in just one year! Since custom made earplugs can last up to five years, you can actually cut costs by investing in custom moulded earplugs for your employees. In addition to the long-term cost savings of custom moulded earplugs, they are also a much greener option of noise reduction. Instead of filling landfills with hundreds and thousands of disposable earplugs every year, invest in a pair of custom moulded earplugs for an eco-friendly solution. If you’re interested in learning more about custom moulded earplugs, contact the specialists at Audiology Innovations in Calgary today. We offer complete hearing evaluations, hearing aid and assistive devices, custom earplugs and more!